How one member created a fantastic woodland spring garden by naturalizing daffodils. Professor Wes Crawford at Purdue University decided some beautiful woodland on his property could be even more beautiful. So for fall, 2005, he ordered hundreds of — always our best-seller — and added them to his woodland. 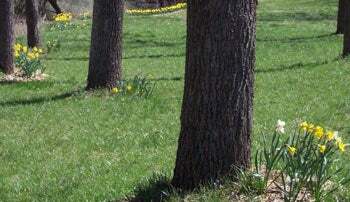 This is what is called “naturalizing” Daffodils — planting them in a natural setting, since these world favorite flowers are famous for “getting by on their own.” Deer don’t eat them, they need no care, and they multiply as the years go by. As you can see below, Prof. Crawford carefully chose areas for best display, and planted what landscapers call “drifts” of daffodils, in spots where they would “light up the woods” in spring. And they certainly did! He’s been kind enough to share these photos with us, and writes that he plans to add hundreds more this coming fall. Prof. Crawford writes that his new woodland garden was a big hit with all visitors and neighbors this spring. He says one neighbor exclaimed, “I’ve never seen such healthy daffodils!” And it’s true. Certain daffodils, like Dutch Master, enjoy being in woodsy natural soil, and often do as well or better there than in a garden. After all, like all flowers, daffodils started out as wildflowers. 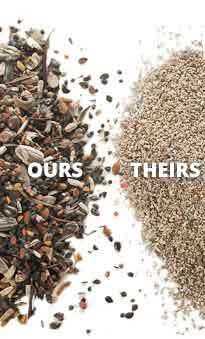 Most of the wild ones are native to southern Europe, mostly Spain and Portugal. We really appreciate Wes Crawford sharing his magnificent woodland garden with all of us. It’s the perfect example of what can be done with almost any natural area, especially with daffodils. His big success is inspiring for many of us who have large or small unused woodland or shady areas we can improve and enjoy each spring. “When I was growing up in the Allegany Mountains of Pennsylvania, there was an old homestead that had been abandoned at the turn of the 1900's. It was a tradition for my family to go to that old homestead every spring to look at the old fashioned daffodils that came up each year. There were thousands of them in amongst the trees that had come up around them. It was beautiful. That old homestead left an impression on me and when I had the opportunity to purchase a 20 acre section of my land that was an old homestead, I immediately thought of the homestead of my childhood. The land that I purchased was grown up and in very poor condition. I bought it in the middle of the winter, so I didn't know if there were any flowers on it or not. 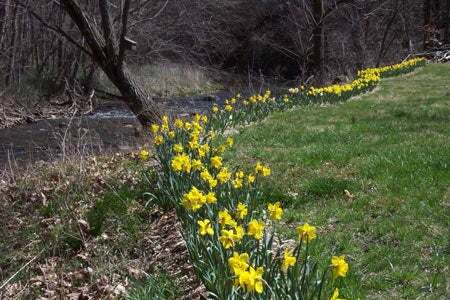 I was delighted when the first spring I owned the land I found several dozen daffodils bloomed. That next fall, I purchased about 300 bulbs on sale from Walmart, Lowes, etc. and planted them. They came up pretty well last spring. They inspired me to purchase more bulbs, so I looked on the internet and found the 50% off deal at AmericanMeadows.com. I purchased about 700 daffodils and planted those in the fall of 2005 and as you can tell from the photos, they were beautiful this spring. Today, I have 110 acres of woodland and meadow. Over 100 acres is Northern Hardwood forest. I have my forest in a classified forest program and it is also certified as a Tree Farm by the American Tree Farm System. I practice sustainable forestry. Holiday Treat, a champion Amaryllis. I now have a rainbow of Irises in my yard! Memorial Garden for "Man's Best Friend"